Congratulations, you’ve got yourself a gun and you want to use it! As a new gun owner, you might be a bit in the dark about how to handle things around the indoor gun range. You want to take your new gun to the shooting range, but you’re feeling a bit nervous, because you don’t know the firing range etiquette? You know your gun safety information, you’ve read the manuals and you remember what your gun dealer told you, but you still feel a bit nervous about going to the indoor gun range for the first time? indoor gun ranges are great because they offer protection from the elements, so no matter what the weather is like, your shooting experience will be undisturbed. Here are some other things that will ensure that your experience remains undisturbed. Let’s begin with clothing and what is appropriate on an indoor gun range. Because there’s no sun, you can forget about sunscreen, but we recommend that you wear long sleeve shirts with tight collars. The shells are quite hot and you wouldn’t want any of them on your bare skin or, even worse, in your bosom. Try to wear comfortable clothes and shoes, that aren’t too baggy or too colorful. Think about wearing clothes that would not distract people from shooting and will not offend anyone. You wouldn’t want to offend folks who are carrying loaded guns, would you? Ladies, remember, that you will be spending a lot of time on your feet, so leave your high heels at home! When it comes to targets you should know that most indoor gun ranges sell them, but just to be sure, you should have a few paper targets on you, just in case they don’t have. Also good to know that some ranges don’t allow targets that have human silhouettes, so stick to bull’s eye ones. One of the most important things you need to know about being inside an indoor gun range is that you must wear eye protection due to empty shells that are being discarded from guns. You can bring your own or you can get ones from the range; in case you want to bring your own, we suggest investing in a high quality product. To be honest, we recommend you bring your own eyewear, because most glasses that gun ranges offer are too big and they need to fit perfectly. Let’s move on to ear protection, because it is vital that you have it. Even if your own gun isn’t too loud and you might think you don’t need ear protection, you may be in for a surprise when you hear your neighbor’s gun. Again, you can bring your own or get the ones offered by gun ranges. If you’re shooting a rifle, then we recommend you buy a spotting scope, to help you see your target and perfect your shot. Even a cheap spotting scope works, so if you’re not planning to use it for anything else, such as spying on your neighbors, then get an inexpensive one that has enough magnification for what you need. Another very important thing when you get to the shooting range is to read all the rules posted there and talk to the range officer about them. Every indoor gun range has their own rules and particularities and it is important to know them before you start having fun with your gun, even if you’re not new to indoor gun ranges in general, but a particular shooting range. One last thing… do yourself and the others a favor and get a gun case. You’re not in a movie to walk around holding a gun or tucking it in your pants. This is the real world and you should store your loaded gun as safely as possible. 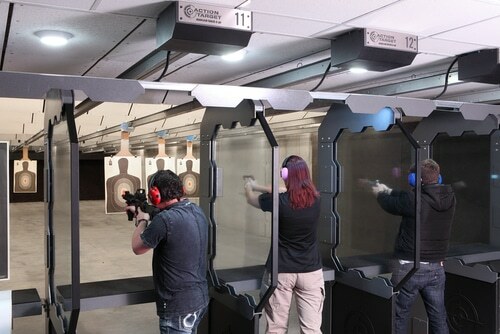 Tell us about your experience at a new indoor gun range. Were you nervous? Did you make any rookie mistakes? Anything you would like to share with us and our readers? Drop us a line in the comment section below, we would love to hear about it. I would like to add a comment about gun range safety. You are there to shoot not to hold distracting loud conversation’s with your friend’s. distracts the person next to you. A range should be enjoyable but not a party. Hey Buddy!, I found this information for you: "What You Need to Know About an Indoor Gun Range". Here is the website link: https://thegunrights.com/need-know-indoor-gun-range/. Thank you.